BACKGROUND: Facilitation of mutual participation, respectful and egalitarian relationship between the mother and the midwife during childbirth is a critical aspect. This article delineated the criteria that would facilitate the implementation of woman-centred care in childbirth units of the Limpopo Province in South Africa, following a concept analysis described in Part 1. Empirical referents or indicators were used to measure the concept woman-centred care and to validate its existence in reality. These empirical referents were referred to as measurable properties that further verified the concept. OBJECTIVE: The objective of this article was to formulate criteria that would facilitate implementation of woman-centred care in childbirth units of Limpopo Province in South Africa. METHOD: Criteria to facilitate the implementation of woman-centred care were formulated by the gathering of information about the topic under review and the use of resources to define the key elements of the criteria which were integrated into the Batho Pele principles. The criteria were then validated by selecting with a vested interest in the successful development and implementation of the criteria. RESULTS: Criteria were formulated to facilitate the implementation of woman-centred care that was integrated within the framework of Batho Pele principles. CONCLUSION: These formulated criteria for woman-centred care will be used as an institutional self-evaluation tool to enhance implementation of the Batho Pele principles in childbirth units. These criteria will give direction and provide guidelines for the performance of midwifery staff and will also help supervisors to guide staff to improve performance. Process criteria define practices that enjoy general recognition and acceptance amongst midwives or authoritative statements by which the quality of midwifery practice can be judged (Danasu 2007). Criteria are also defined as a performance model that is used to judge quality of childbirth objectives, orders and methods. This article describes how formulated criteria were integrated within the framework of Batho Pele principles to provide a guide to the knowledge, skills, and attitudes needed to provide safer and efficacious midwifery care. Such criteria would assure women that they are receiving high quality midwifery care. Midwives would also know exactly what is necessary to provide quality care, and that measures are in place to determine whether the care meets the standards. Part 1 of this study (Maputle & Hiss 2013) analysed woman-centred care as a core concept and was relevant to childbirth care within the framework of the Batho Pele principles as a customer focused approach. An extensive literature search of computerised databases and manual searches of relevant journals were undertaken to determine the characteristics associated with the concept of woman-centred care. The literature based analysis included specific disciplines, namely, nursing, medicine, humanities and nursing management. The concept analysis (Part 1 [Maputle & Donavon 2013]) found that woman-centred care refers to a complex, multidimensional, dynamic process of providing safe, skilled and individualised care (Rush 1997, cited in Hutchfield 1999:1183). It responds to the physical, emotional and psychosocial needs of the mother. Woman-centred care as outlined within the context of the Batho Pele principles in the White Paper on Transforming Public Service Delivery (Department of Public Service and Administration 1997), is a customer-oriented form of care. This means that a midwife consults the mother, encourages her participation and supports her choices about the services offered. The Batho Pele principles further advocate that mothers should be allowed to- practice their own preferences (be given courtesy), and to have access to personal control and decision-making (access). Moreover, the mother is given full and accurate information about childbirth and the midwifery care to which she is entitled. Unsworth (2000:318) refers to woman-centred care as the sum of activities that include emotional involvement, responsible participation and a sharing of practical and technical knowledge of health care. The empirical referents of woman-centred care were found to be mutual participation and responsibility sharing, information sharing and empowering, communication and listening, accommodative midwifery actions and maximising human and material infrastructure. The defining empirical referents of woman-centred care were measured through the use of the customer-care approach (Batho Pele principles). Each of these referents was integrated within the Batho Pele principles (Table 1) and these were used to formulate the criteria in Appendix 1. 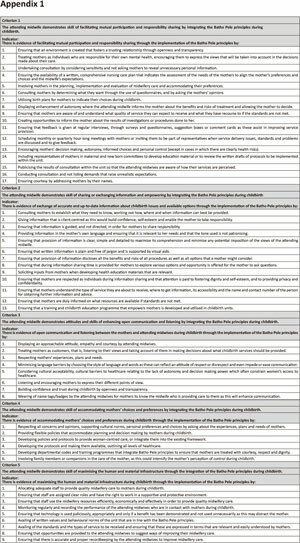 In this article, criteria define the characteristics or behaviours used to measure the level of midwifery care. Criteria were derived from the values (Batho Pele principles) that described the level of midwifery care considered acceptable. Chinn and Jacobs (1987:98) pointed out that criteria specify the characteristics typically present whenever a particular object, property or event occurs, whilst Muller (2002:207) suggested that criteria are refined dimensions of interest that can actually be measured. An article on patient empowerment (Anon 2002) supported the view that criteria are defined as standards by which an action can be measured. Criteria allow comparisons to be made and are thus key parts of the prioritisation process. According to Muller (2002:204), there are three different types of standards (criteria), namely, (1) structure, (2) process and (3) outcome. In this article, the researchers adapted the process type to formulate the criteria to facilitate the implementation of woman-centred care. A process type describes the performance of an action or nursing act (Muller 2002:204). This will provide a means for analysing the efficiency or productivity of midwifery care for women in childbirth units. These criteria will be used to monitor whether efficient utilisation of services delivered according to Batho Pele principles results in quality woman-centred care. In attempting to develop these criteria, three basic questions were answered, namely, (1) what to measure, (2) where to measure it and (3) how to measure it. A concept analysis of woman-centred care was conducted (see Part 1 [Maputle & Donavon 2013]). A framework, as suggested by Walker and Avant (2011, 2005:63-84), was used for analysis. 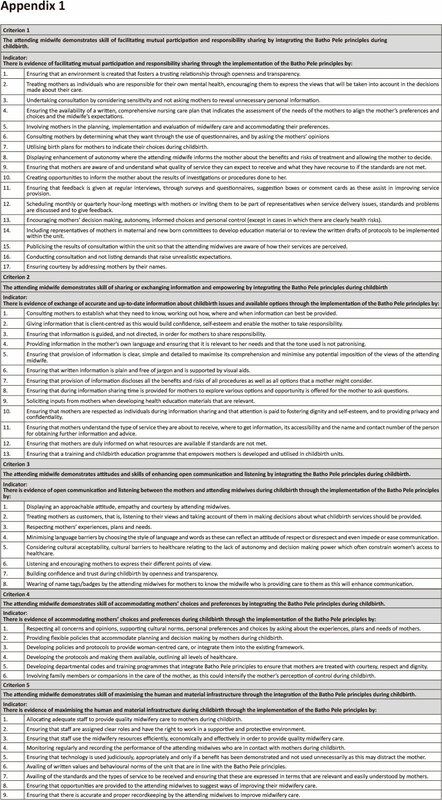 The steps included selection of a concept woman-centred care, specification of the aims of analysis, identification of uses, characteristics or connotations of the concept, determination and definition of attributes, development of the model cases, which exemplified the analysis, identification of antecedents and consequences, and definition of empirical referents. The final step of the analysis was to identify the empirical referents that were the indicators used to measure the concept to and validate its existence in reality (Walker & Avant 1995). Empirical referents can also be referred to as measurable properties that further verify the concept. Empirical referents were defined as classes or categories of actual phenomena that by their existence or presence demonstrate the occurrence of the concept itself (Walker & Avant 1995:46). They further state that referents, once identified, are extremely useful in instrument development because they are clearly linked to the theoretical base of a concept, thus contributing to both the content and construction of the instrument. As such, they provide clear and observable phenomena of the concept. Furthermore, instrument development in itself is an operational definition (Burns & Grove 2009:147). Criteria were thus formulated to facilitate the implementation of woman-cantered care (Appendix 1). This was done by the gathering of information about the topic under review and the use of resources to define the key elements of the criteria which were integrated into the Batho Pele principles. To validate the formulated criteria, the researcher selected several stakeholders (Table 2). Polit and Beck (2008:320; 2010) indicate that stakeholders should be individuals or groups with a vested interest in the successful development and implementation of the criteria. The empirical referents of the concept woman-centred care was integrated into the Batho Pele principles and criteria were formulated shown in Appendix 1. The formulated criteria were validated by the relevant stakeholders. Validation is a method of determining the- credibility of empirical knowledge in relation to a scientific model of a discipline (Chinn & Jacobs 1987:13). Irobi, Andersson and Wall (n.d.:2) described validation as taking a decision whether the model (criteria) in question is valid. They further pointed out that validation assures that a model contains the features imputed to it, which implies that it is well grounded, sound or capable of being justified. The purpose of validation in this paper was to identify the value and potential contributions these criteria could make to the provision of woman-centred care in the childbirth units at the tertiary hospital in the Limpopo Province. Purposive sampling was used to select the appropriate participants (Table 2). Purposive sampling is a type of nonprobability sampling which is collected from a group of respondents chosen for a specific key characteristic (Sells 1997:172). The researchers used their judgement to select the participants who had most of the required attributes and represented the different categories to validate the criteria for implementation. Although this was a subjective method of sampling, it was necessary to include midwifery experts, policy makers, unit managers (supervisors) and providers of midwifery care in the validation, since all these participants were involved in the teaching, planning and provision of childbirth care. appropriately integrated into the Batho Pele principles to facilitate mutual participation during childbirth. Ethical approval to conduct the study was obtained from the Ethics Committee of the University of Johannesburg and permission from the Limpopo Provincial Department of Health. The ethical standards as set by Democratic Nursing Organisation of South Africa (DENOSA) were adhered to before and during the structured data collection regarding privacy, anonymity and confidentiality (DENOSA 1998). The comments from the participants indicated that they were satisfied with the descriptions of criteria, as these descriptions were real representations of how they would prefer woman-centred care to be provided at the tertiary hospital in the Limpopo Province. These comments contributed to the truth value (credibility) of the study. Three experts in midwifery and nine other participants (two policy makers, two unit managers and five providers of midwifery care) were granted opportunities to make suggestions or comments that could contribute to the finalisation of the criteria. Two midwives (the policy makers) from the Directorate of Maternal, Child and Woman's Health in the Department of Health, who were involved in policy making on activities and programmes relating to mother, child and women's health, strongly agreed that the five formulated criteria were applicable and relevant to enhancing the provision of woman-centred care in childbirth units and were appropriately integrated into the Batho Pele principles to facilitate mutual participation during childbirth. Likewise, all seven unit managers and providers of midwifery care strongly agreed that the five formulated criteria were applicable and relevant to enhancing the provision of woman-centred care in childbirth units and were appropriately integrated within the Batho Pele principles in order to facilitate mutual participation during childbirth. The three lecturers involved in teaching Midwifery Nursing Science also agreed that the criteria were applicable to midwifery practice, with a suggestion that the outcome be 'interdependence' rather than 'independence'. Replication studies would be conducted for the criteria to be applied in other contexts in the Limpopo Province. The study, therefore, concluded that all the stakeholders had reached consensus on the proposed criteria. They agreed that these should be recommended and implemented in one district, as a pilot study to provide practical validation. Chinn and Jacobs (1987:165) point out that theory testing research has immediate practical application. By conducting or replicating the study in other districts at a later stage, the results may have wider significance and impact. The criteria for ensuring trustworthiness as outlined in Guba and Lincoln (1985:301-318) were used. Peer debriefing was- achieved through discussion with peers who are outside the context and who have a general understanding of the issues involved. Presentations were made at research committees and seminars that were attended to establish the truth value of concept analysis. Transferability was attained through thick description of the methodology. On the basis of the results, a need was identified to formulate criteria that would encourage participation and collaboration so that attending midwives could enhance the self-determination of mothers during childbirth. It is recommended that the criteria should be applied in maternity or obstetric and neonatal units, general nursing science and nursing research units, and at any institution where there is interaction between a mother (patient) and an attending midwife (nurse). It is a special challenge for those involved in obstetric units to improve their practices so that mothers, who were less participative, may be able to participate more fully in the future. Since mothers experienced dependency and limited participation during childbirth, the criteria could serve as a frame of reference to enhance mutual participation and shared responsibility, sharing of information, and empowering and interdependence during childbirth in the obstetric units. The criteria for woman-centred care could be used as an institutional self-evaluation tool to enhance the implementation of the Batho Pele principles. Dependency and limited participation may be experienced in all general wards in hospitals whenever a patient is involved in interaction with a nurse. As stated earlier, to be in line with the White Paper on Transforming the Public Service Delivery (Department of Public Service and Administration 1997), the Patient Charter and the Constitution of the Republic of South Africa, it is recommended that the criteria be implemented in general wards as well. The criteria are aimed at enhancing the provision of woman-centred (patient centred) care, which will facilitate mutual participation and sharing of responsibilities, create opportunities for information sharing and empowering, open communication and listening, and promote accommodative midwifery actions and the maximising of human and material infrastructure during the provision of care. Mutual participation - egalitarian and respectful relationships. Equality includes the principle of power sharing and responsibility; there should be negotiation between the mother and the midwife. Sufficient information which is thought to be a prerequisite for decision making should be provided. Interaction that takes place between the mother and the midwife should enhance the self-esteem and self-determination of the mother. The midwife and the mother should listen to each other because they engage in a dialogue to identify preferences and expectations, and a new strategy for change is thus constructed. Attention should be given to interaction skills by which participation can be enhanced and the practices of attending midwives should be studied to identify how these enhance or inhibit participation. Each of the above may be a research topic in itself. Subsequent research on experiences during childbirth could be replicated in any hospital in any district. Such endeavours could address the strategies of enhancing mutual participation during childbirth. The hypothesis was formulated and could be tested in replicated (follow up) research. This hypothesis could be: mutual participation and responsibility sharing during childbirth can be enhanced by the provision of woman-centred care. The formulated criteria (Appendix 1) would be made available to the Maternal, Child, and Woman's Health Directorate, for them to evaluate whether the said criteria are implementable within the Department of Health. The criteria could be implemented in order to improve communication and enhance mutual participation and responsibility sharing, information sharing and empowering, increased decision making and informed choices, and build capacity during childbirth. The criteria were formulated with the aim of enhancing the provision of woman-centred care which would facilitate mutual participation and responsibility sharing, creation of opportunities for information sharing and empowering, open communication and listening, accommodative midwifery actions and maximising of human and material infrastructure during childbirth. These formulated criteria will further be used as an institutional self-evaluation tool to enhance the implementation of the Batho Pele principles. The researchers would like to thank the Department of Health, Limpopo Province, for granting the permission- to conduct the study. Appreciation is extended to all the participants for their active involvement in the study and for providing necessary information. The authors declare that they have no financial or personal relationship that has influenced us in writing this article. M.M. (University ofVenda, South Africa) and D.H. (University of the Western Cape) were involved in conceptualisation of the project. M.M. (University of Venda, South Africa) collected and analysed the data and D.H. (University of the Western Cape) wrote and edited the manuscript.